KATHMANDU, June 30: Until a few years ago, KP Oli, who was then one of the deputy leaders of his party, was known as a firebrand in criticizing the ruling party and the then Maoists . But his approach of mocking others has not changed even after becoming the chief of the party and of the government, twice. During the discussions on budget appropriations for the departments in his portfolio, Oli responded to serious queries by members of parliament by only making fun of them. Oli started his response at the House of Representatives on Friday by questioning the ability of the MPs to ask questions. “No questions have been raised as questions. It seems they were raised just for the sake of raising them, maybe because there were no other issues in the budget to question,” he said. Terming proposals from opposition lawmakers to make corrections in the budget as a mere ritual, Oli said he however felt constrained to respond to their concerns, whatever be the manner in which they have been raised . NC Chief Whip Balkrishna Khand termed Oli’s way of undermining other leaders and lawmakers as objectionable. “Oli has adopted a more autocratic approach in recent days especially after securing a near two-thirds majority in parliament following the unification of the two communist parties. The way he mocked a former prime minister and people’s representatives in parliament today [Friday] is objectionable. The opposition’s patience may burst one day if he keeps this up,” said Khand. Lawmakers had expressed serious concern as to why the prime minister brought the National Investigation Department, Revenue Investigation Department and Anti-money Laundering Department directly under his own office. In response the prime minister became satirical. “Lawmakers should instead have accused the government of not being serious when it reduced the number of ministers to 25 from 64 in the previous government,” said Oli. He also said the lawmakers did not understand the changed context after the enactment of the new constitution. NCP lawmakers for their part applauded the satire, thumping their desks. In a rare instance in parliament, Oli also mimicked main opposition leader Sher Bahadur Deuba’s mannerism of repeating some stock words and syllables. Oli also pooh-poohed the accusation against the government that it was becoming autocratic as baseless. “I want to assure you that we are committed to safeguarding democracy because we all fought long and hard for it and it was not gifted to us by anyone,” he said. He likewise ridiculed the serious concern over rising corruption raised by some lawmakers, and their choice of words. He said they should instead have asked whether corruption had been brought under control, instead of if it had been eradicated. Oli deliberately avoided a question about delay in post-quake reconstruction and the government’s plans to help the victims, accusing former CEO of the National Reconstruction Authority, Govinda Pokhrel, of supporting a particular political party instead of working sincerely. “A political cadre was appointed CEO of NRA, and he was focused on elections more than on reconstruction work. When we looked for him, they said he had left for the districts for electioneering,” he said. Responding to NC lawmaker Minendra Rijal’s question about whether a communist government would succeed in owning a railway in Nepal, Oli satirized the details of the question and interpreted it as a protest against his railway plans. “He knows every detail, I respect his intellectual prowess and I don’t want to add anything. I just want to say our own railway will come to Nepal and we will operate it,” he said. In response to NC Chief Whip Bal Krishna Khand’s concerns about the government decision to fix protest areas and prohibit protests in other areas, Oli questioned Knand whether he had seen people protesting in front of the president’s or prime minister’s office in India? “The prohibition is not aimed at prohibiting differences, but protests should be regulated and should abide by certain norms,” he said. “We had to enter the palace to oust autocracy. But in a democracy there should be a proper procedure for protests.” Indicating the hunger strikes by Dr Govinda KC, Oli said such protests at hospitals and other vital facilities cannot be tolerated. Also mocking the concern of lawmakers about Nepal’s snail-paced progress in agriculture, Oli said, “Has this government pushed Nepal back in agriculture?” He seemed to be expecting applause while saying this. Responding to lawmaker Prem Suwal’s concerns about women laborers, Prime Minister Oli brushed them aside, claiming that the question was based on an old report. On a separate note, Oli said that the issue of providing pensions to citizens above 65 years was just an election propaganda. Prime Minister Oli also reiterated that the constitution can be amended only to address Nepal’s domestic concerns and not because any outsider demands it. 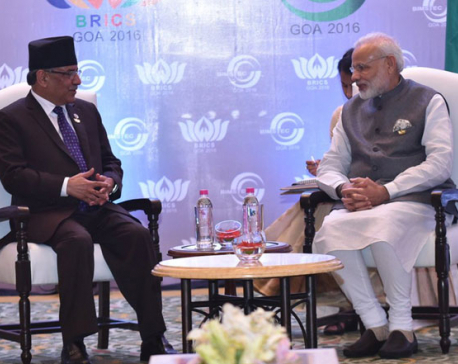 “Nepal will not act under pressure or interference, it acts as per our own necessity,” he added. He said a Nepal-India joint team has been working to settle the dam construction issues along the border and the present government has started removing dams that affect Nepal.